Home Eco Ideas	Meet Sawyer, a wooden frame bicycle for eco commuters! Meet Sawyer, a wooden frame bicycle for eco commuters! You have seen gear bicycles, you have seen weird bicycles as well! However, have you ever seen a bicycle that’s made of wood? You will hardly find a store where you could buy a bicycle with a wooden frame, though, on the internet, you may find some amazing wooden bike concepts. A new bicycle design, however, has taken the world by storm. 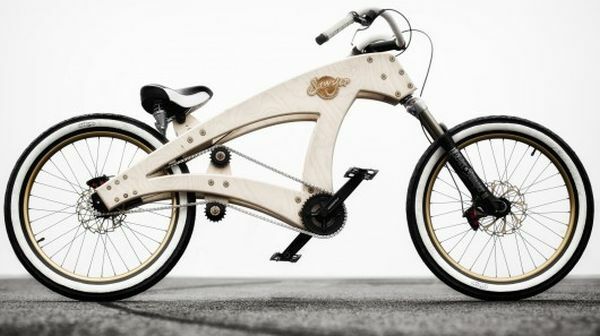 Called ‘Sawyer’, this is a stylish low-rider cruiser bicycle with its body made from flat beech plywood. Probably if IKEA were to use wood to make bicycles instead of furniture, it would use ‘Sawyer’s’ prototype! The fully functional bike is one of the lightest bikes ever made with a strong and sturdy body. Devised by Jurgen Kuipers, the Sawyer wooden frame bike has already won this year’s International Bicycle design competition. In its initial forms, it weighs around 25 kilograms and now the artist is quite excited for the commercial production of the bike. Sawyer is considered a very handy and completely customized version of cruiser bikes. Customization makes it a more personalized product. At the same time, the bike is safe to use, has indomitable strength and would work best for bike lovers. The usage of wood makes it special and unique. Kuipers’ Sawyer bike has a scale size of 1:1. Just like a model airplane set, the bike parts are there in the frame and the non-wooden parts are made up of plastic. Swayer can revolutionize the idea of biking. With this product in the market, bikes will become more designer, lightweight and absolutely strong. The structure of the bike is quite innovative and a perfect ride for everyone. Currently, we don’t have any such bikes available on the market. So, it could be the one of its kind bike if it ever hits the production lines anytime soon!